Perhaps the least known star in the Red Dots campaign, Ross 154, is a rapidly rotating M dwarf star that shows elevated activity levels and and flares on its surface. 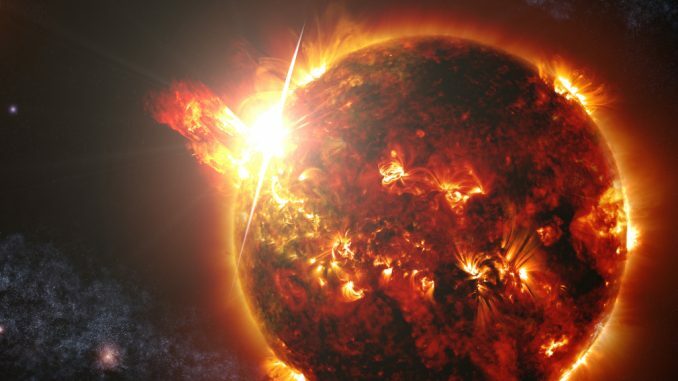 This makes the Red Dots campaign targets more diverse than they otherwise would be – rapid rotation is typically interpreted as a sign of young age of such stellar objects as the rotation period is thought to gradually increase due to magnetic friction resulting in old M dwarfs with slow rotation rates such as Proxima Centauri whose rotation period has been estimated to be 83 days1. Indeed, Ross 154 has been estimated to have an age of less than one billion years2. 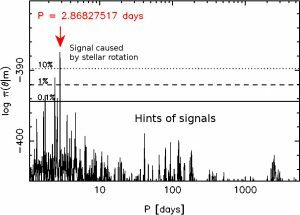 The rotation of Ross 154 induces a clear photometric cycle of 2.87 days in our All Sky Automated Survey V-band observations but the brightness of the star also varies with another cycle of 740 days that we interpret to be caused by the star’s activity cycle (Fig. 1). Knowing these two “fundamental” cycles helps interpreting any and all periodicities in the radial velocity data because periodicities that are independent from both rotation and magnetic and/or activity cycles could correspond to planets orbiting the star. Fig. 1. Likelihood-ratio periodogram of ASAS V-band photometry of Ross 154 showing evidence for a rotation period of 2.87 days and a magnetic activity cycle of 740 days. Due to its young age, Ross 154 is an active star and its radial velocities obtained by four independent spectrographs have elevated noise levels due to the star’s active surface. These high-precision spectrographs are HARPS (3.6m telescope, La Silla, Chile), HIRES (Keck telescope, Mauna Kea, Hawaii), PFS (Magellan 6.5m telescope, Las Campanas, Chile), and UCLES (Anglo-Australian Telescope, Siding Springs Observatory, Australia) but their precision is limited by stellar activity that induces radial velocity noise of some 10-20 m/s in the data, depending on the instrument. Fig. 2. Probability distribution as a function of signal period for Ross 154. The dominant maximum corresponds to a signal caused by the star’s rotation. Fig. 3. Probability distribution as a function of the period of a second hypothetical signal for Ross 154. The emerging maxima are probably caused by stellar differential rotation and aliasing. 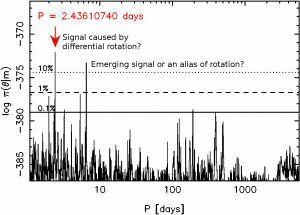 Although reasonably noisy due to elevated activity in comparison to the typical radial velocity noise in M dwarf data of 2-4 m/s3, Ross 154 appears to have a moderately significant periodicity in its velocity data set caused by the stellar rotation and the co-rotation of starspots on the stellar surface (Fig. 2). The Ross 154 radial velocities also show hints of additional periodic signals (Fig. 3), although they are not significantly present in the data. These are likely caused by aliasing and differential rotation of the star but the interpretation is difficult because there is not enough data to rule out alternative solutions present as local probability maxima in Figs. 2 and 3. The current data set is severely limited because the most precise HARPS data set contains only eight velocities. Red Dots campaign will increase this number roughly by a factor of ten, making it possible to search for signals of planets orbiting Ross 154. Johns-Krull, C. M. & Valenti, J. A. “Detection of Strong Magnetic Fields on M Dwarfs”, The Astrophysical Journal, 459, L95 (1996). Butler R. P. et al. 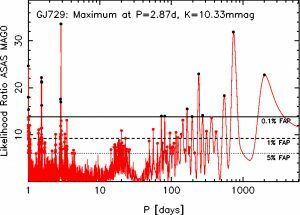 “The LCES HIRES/Keck Precision Radial Velocity Exoplanet Survey”, The Astronomical journal, 153, 208 (2017). Why the rotation signal is so periodic? It should be semi-periodic due to differential rotation. Are there any overlap with window function? The rotation signal is actually not strictly periodic, but consists of a bunch of peaks in the period space around the strongest maximum. I tried to subtract the short rotation period from the data, but the residual periodograms always had nearby periods that showed as strong peaks after that. So you are right, it is only quasi-periodic, but still the strongest peak in the photometry. This also indicates that the dominating photometric short-period signal is indeed a sign of the star’s rotation precisely because it shows evidence of differential rotation. It is easy enough to see that there are multiple cycles, rotation coupled with the star’s differential rotation and longer cycles that are also likely caused by the star’s activity. But my analysis shows that the period in mag0, mag1 and mag2 is 3.25d while P=1.54d and 2.85d for mag3 and mag4 light curve. The long periodic cycle seems to be around 1943d rather than 740d. I am not sure whether you have used the same data as mine or not. I have only used grade=A points. Another period around 20.33d appear in all bands. It is probably correspond to the rotation period. The 2.85 and 3.25d may be correlated to the window function which is significant around 2.06d. It is also interesting to find that 1/(1/2.85-1/20.33)=3.31 . Could it be that we are talking about different targets here? I used grade A data only, removing all 5-sigma outliers. To make sure we are talking about the same thing, please download the data I have from here: MAG0, MAG1, MAG2, MAG3, and MAG4. The aperture with the lowest variability is MAG2, and its periodogram is the one presented in the text. Yes, the signal around 2.86d seems to be in all data sets now.